2 Cut off the ends of each butternut squash and discard. 3 Peel the squash and cut in half lengthwise. 4 Using a spoon, remove the seeds. 5 Cut the squash into 1 1/4" to 1 1/2" cubes (large and uniform is best), and place them on a baking sheet. 6 Add the melted butter, brown sugar, salt and pepper. 7 With clean hands, toss all of the ingredients together and spread out in a single layer on the baking sheet. 8 Roast for 45 minutes to 55 minutes, until the squash is tender and the glaze begins to caramelize. 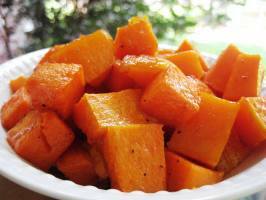 9 Turn the squash while roasting a few times with a spatula to be sure it browns evenly. 10 Adjust seasonings if needed.